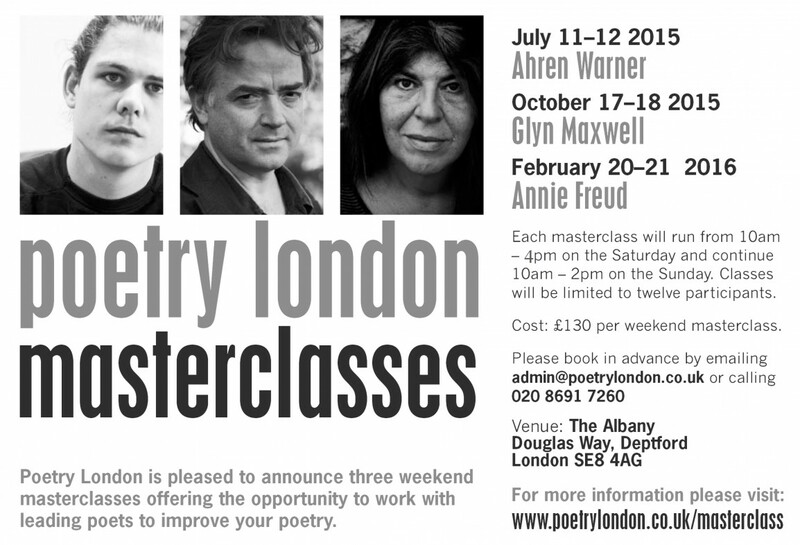 Poetry London is pleased to announce a series of three weekend masterclasses with three leading poets: Ahren Warner, Glyn Maxwell and Annie Freud. This is an opportunity to spend two days working to improve your poetry alongside a small group of fellow poets. The masterclassses will be limited to twelve places, so early booking is essential. Each weekend masterclass costs £130 and will be held at the Poetry London offices. July 11 – 12 2015: Ahren Warner. October 17 – 18 2015: Glyn Maxwell. February 20 – 21 2016: Annie Freud.